I've been obsessing about overdrive/distortion pedals lately - for the modular. I really like the kind of rich tones that people like Tom Hall get on their tracks; since I know Tom Hall, I could ask Tom Hall! 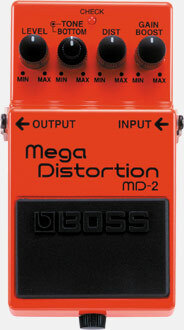 He pointed me to a few different things, but suggested the Mega Distortion MD-2 for one specific feature: the 'Bottom' tone control. He points out that most distortion pedals razz up the sound but bleed away the low end - not what you'd really want for a synth tone. Best sawbuck I've spent on the modular in ages! Your comment on the bottom end control is interesting. How does it sound on 808 & 909-style kicks? I tested this out over the weekend - and didn't get super-helpful results. Things sound different than a normal overdrive/distortion - you can dial in more bottom end than something like the Turbo Rat or DS-1. But as you increase the 'dist' level, the low end starts getting starved out of the mix. I actually found that the best thing was to mix in some original with the distorted (not using the level, but using a splitter/mixer); that allows me to pull in low end (esp. on the 808) while still having the bang of the MD-2.